Jacqueline Du Pre was born in Oxford and commenced learning the cello at the age of five with Alison Dalrymple, she then went on to study with William Pleeth at the age of ten. Only five years later she was enrolled to the Casals Master Class at Zermatt, Switzerland. She made her formal début at the Wigmore Hall in March 1961 accompanied by Ernest Lush. It was her concerto début in March 1962 at the Royal Festival Hall, performing the Elgar Cello Concerto that propelled her career into the stratosphere - bringing spontaneous critical enthusiasm followed by global recognition. Music for Viola & Cello Played By Herbert Downes & Jacqueline Du Pre28 July 2017 by Electric Recording Co. Although this disc is most famous for being Jacqueline Du Pre’s debut cello recital, we should certainly not bypass the marvellous contribution from the distinguished artist Herbert Downes. Born in 1909 Downes began playing the violin at the age of 10, before going on to study under both Paul Beard and the legendary Carl Flesch. He was a founder member of the famous Philharmonia Quartet in England along with Henry Holst, Ernest Element and Anthony Pini. Downes initial instrument of choice was the violin, but he later became more well known for his playing of the Viola. As an avid collector of instruments and bows he eventually acquired and played a 1560 Gasparo da Salò. These short works contained on the A Side of this superb disc showcase Downes skills an expert chamber music player of immense talent. It is quite remarkable to think that Du Pre was just 17 years of age when she recorded this first recital disc for HMV. Whilst listening one cannot help but think this is an artist who has already lived life to the full; her interpretation has a profound and identifiable maturity that suggests a level of life experience well beyond her young years. Du Pre’s later struggle with ill health in her late 20’s, which tragically prevented her from continuing to play the cello makes listening to this remarkable recital even more poignant; Du Pre was without doubt one of the finest cellists of the 20th Century. Stereo - Only 300 copies of each will be sold. Yes $555 is a great deal of money for a single record, but considering what an original costs and that this superb sounding reissue is limited to three hundred copies and ERC promises to never press more, it too is likely to appreciate in value over time. At last, collectors, connoisseurs and audiophiles alike can enjoy these enduringly desirable, yet for so long elusive recordings as they were originally intended to be heard, seen and savoured; and without having to re-mortgage their houses to enjoy the privilege. 'Records' have been cherished objects of veneration almost since Thomas Edison announced the invention of the first phonograph, back in 1877. Since then, whether wax cylinder, shellac 78 or vinyl disc, rationales for revering and collecting records have been innumerable, pervasive and often idiosyncratic: motivated by anything from pure aesthetics and musicological study to an obsessional, sometimes fetishistic, desire to own the rare and the recondite. 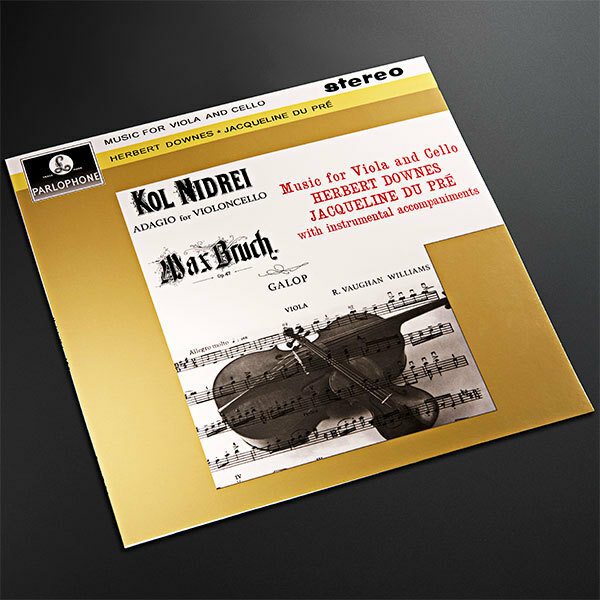 For many genuine audiophiles, however – especially those devoted to the classical canon as reproduced on the music connoisseur's enduring format of choice, vinyl – its is the perfect marriage of timeless, tour de force studio performance and premium analogue recording and mastering processes which will forever define phonographic allure. That being the case, the 1950s and early ’60s – represents a veritable record collector’s Xanadu; an unequalled cornucopia of hungrily sought-after classical treasures, celebrated by critics and collectors alike for both its gilded artistic repertoire and as a high-water mark in faithful, sensitive analogue audio reproduction. It is a mother lode whose treasures have not been easy to access of late, however; indeed, much of the most sought after vinyl catalogue has languished out of print for several decades. Thus, mint copies of vinyl albums from the era’s glittering trove have taken on almost mystic, Holy Grail proportions in recent years – and when they do come to light they are known to exchange hands among collectors for jaw-dropping sums. All of which underscores what a major coup the Electric Recording Co. have pulled off in licensing key catalogue titles, almost exclusively from the aforementioned ‘golden age’, in order to reissue them on audiophile quality vinyl. Re-mastered using sympathetic, all vintage valve equipment and presented in faithfully reproduced, hand-crafted letter pressed sleeves, this is a re-release programme on a lavish scale, hallmarked by unprecedented attention to detail – one which is surely destined to exhilarate classical recording devotees around the globe. The reissues, all fully sanctioned by the original copyright owners, are to be divided evenly between mono and stereo recordings (as was the original catalogue) and unleashed in strictly limited, individually-numbered editions of 300 at regular intervals over the next five years. Among the many scheduled highlights are currently rare-as-hen’s-teeth albums by some of the classical canon’s most illustrious performers, including genuinely iconic recordings by violinists Johanna Martzy, Leonid Kogan and Gioconda De Vito, ‘French School’ pianists Yvonne Lefébure and Germaine Thyssens-Valentin and cellist János Starker. The Electric Recording Company is an offshoot of Electric Mastering, London’s premier analogue record-mastering suite and a redoubtable repository of perfectly restored and lovingly maintained vintage valve machinery from the 1950s, ’60s and ’70s. Indeed, in the world of 21st century mastering, Electric is a wonderful anomaly, the only such working facility anywhere which uses (strictly in the manner first prescribed by disciplined sound engineers over half-a-century ago) the equipment which leant sonic luminosity and untrammelled fidelity to any number of the classic albums which are still widely admired by audiophiles today. Thus, Electric is uniquely equipped, both technically and in terms of its engineers’ expertise, to breathe new life into these highly-prized recordings, making them sing again with a rich, precise, fully-nuanced lucidity that is at least the match of the half-century-old EMI rarities (if you can find an affordable, unscratched copy with which to make the comparison, that is). Why go to these extraordinary lengths to reproduce a five-decade-old (and more) catalogue in such fastidious, retro-technical detail? The aforementioned audiophile discernment is the short answer; for while some selections from these historic label trove’s were sporadically repressed during the ’70s and ’80s, the valve (or ‘tube’)-powered mastering machinery of the preceding decades had by then been superseded by strictly transistor-based cutting systems, producing albums that for many connoisseurs lacked the sonic charm, warmth and nuance of their valve-kissed predecessors. Indeed, such remastered works were eschewed by aficionados all too aware that these classic albums, recorded in the middle of the 20th century when analogue sound recording was in its technological pomp, had been captured using the finest valve machinery and that such recordings naturally lent themselves to the warm, dynamic embraces of precision valve circuitry and mastering lathes. To achieve their scrupulous sonic ends, Electric’s engineers have worked directly from the precious original studio master tapes, maintaining a purist, simpatico approach at every stage. With all sound signals passing through tube circuitry and eschewing any transistor or digital processes in order to preserve the vital, all-valve system approach used to create the original albums in the first place (the transistor and digital alternatives found in most modern mastering suites dovetail with later mechanical approaches to record production, of course), this has been a considerable technical undertaking and a genuine labour of phonographic love. In the age of digital re-mastering, when master tapes of wildly differing provenance can be instantly homogenised with a swift software abracadabra, it may seem curious to some that Electric’s engineers have chosen to ignore such technology, or any after-the-event equalization processing at all, come to that, preferring to preserve the authenticity, even idiosyncrasy, of the original masters – the products of several studios and more than one country – and remaining loyal to the production values on the tapes rather than to the signature of a contemporary mastering engineer. Really, they had no choice; given the sine qua non of this project; to do otherwise would be akin to cleaning a precious oil painting with turpentine. To ensure this unsullied fidelity, copies of the original EMI records were used as reference during each mastering session, with the guiding rubric being that whatever is on the tape should be transferred faithfully to vinyl: a consideration of purity in terms of recording heritage as much as notional, subjective audio 'perfection'. For mono masters, the engineers have deployed vintage Danish Lyrec valve reel-to-reel tape recorders and Ortofon valve cutting lathes – machines actually designed to work synergistically by the same exacting manufacturers (Ortofon’s renowned Dr. Schlegel was the pioneer of the moving coil cutterhead – a major advancement in mastering technology that dates from the close of the Second World War – and the company remains the industry leader in valve record-cutting technology after more than 60 years spent manufacturing the specialist mastering engineer’s lathe of choice). Stereo masters also use vintage Neumann and Lyrec valve lathes in tandem with another technological rarity, the hefty EMI BTR2 reel-to-reel valve tape recorder, a wonderful, robust machine so revered in mastering circles that even EMI’s deadly rivals, Decca, once swore by it, as did the BBC, IBC and others, including, naturally, EMI’s own Abbey Road facility. To underscore the integrity and authenticity of Electric’s approach to these reissues, the mastered discs will even be pressed, at sturdy audiophile weight. Similarly, the opulent, hand-crafted jacket artwork, which replicates the original imagery, credits and sagacious liner notes, eschews modern reproduction techniques in favour of a painstakingly retyped brass letterpress print procedure carried out by a specialist firm of artisan printmakers.